In this large suburban project we took into consideration many details, such as the room size, the floor treatment, the overall design of the house, lighting etc. 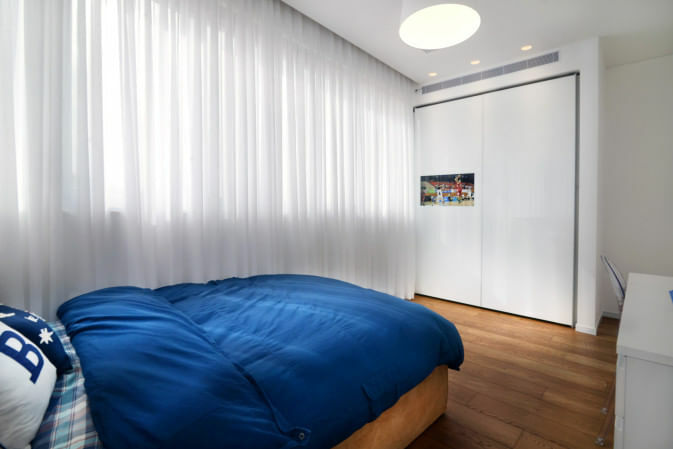 The closet chosen for this space was a hovering sliding door with a TV, all white, which gives the room an elegant yet young look. The wood textured floors create a nice contrast between warm and cold. The overall look is sophisticated yet suitable for a young boy, clean and uncluttered, magnifying the size of the room. The closet was built inside a recessed niche and was built up to the ceiling taking advantage of as much space as possible. The room’s design is in line with the overall interior design of the house, providing a unified, harmonious look.